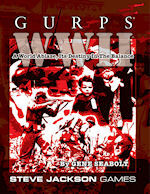 GURPS WWII included a special edition of GURPS Lite for WWII. You can download the PDF of this section for free. Prepare for your finest hour as GURPS explores the defining event of the 20th century – World War II. GURPS WWII provides an overview of the war that transformed the globe, reviews of the nations and armies in the thick of the fighting, and descriptions of their primary weapons and vehicles. It also includes a modular vehicle-design system, for tailoring equipment in alternate-history campaigns or simply perfecting the unstoppable tank! This is the core book for a complete line of GURPS WWII volumes. These further illustrate specific nations and theaters, the naval and air wars, additional equipment, and much more. This book was also printed in a Limited Edition Hardcover.